International Conference on Innovation in Education, Science and Culture (ICIESC-2018) will be held in the Le Polonia Hotel, Jalan Jend. Sudirman No.14 Medan City, North Sumatera Province – Indonesia. ICIESC wecomes you to submit your papers on topic indicated below in section “SCOPE”. All submitted papers will be reviewed by the scientific committee of the conference based on quality, relevance and originality. 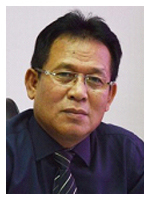 Prof. Dr. Syawal Gultom, M.Pd. View the theme and scope topics. All review processes are blind peer-reviews.